The cost to use water does not reflect the cost to the environment and society – institutions have been able to use natural resources at minimal expense. We all consume water faster than it can be naturally replenished and our draw on groundwater and river supplies affects ground stability and causes biodiversity loss. Our water use at CSU can be quite substantial and so it’s clear that we have a responsibility to ensure appropriate management of water. State and federal government legislative requirements drive CSU and other institutions to use water wisely and efficiently in our operations. The impacts of climatic conditions, such as drought and unpredictable rainfall patterns, in conjunction with local water restrictions, have forced us to carefully scrutinise where we can save water. Saving water also benefits the bottom line by reducing water bills and saving CSU money. Water management is about improving our operations to reduce water use. This applies to facilities, such as toilets, taps and showers, but also to the way we water campus grounds and how water is used in laboratories. A heightened sense of social responsibility in relation to water-related climate change issues. 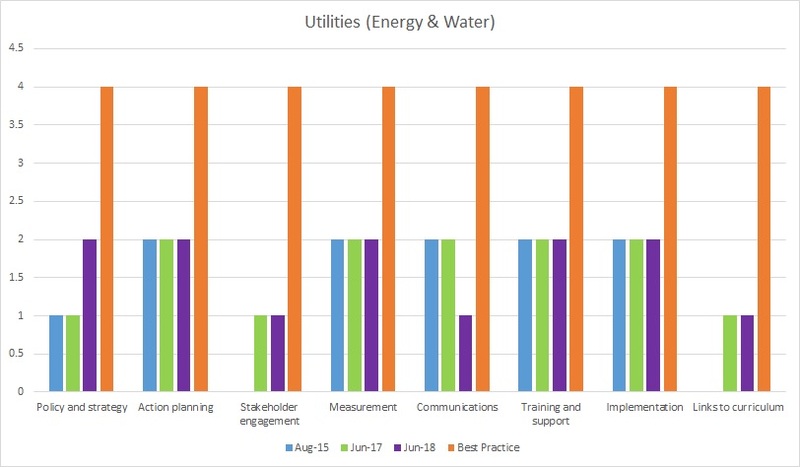 This framework was benchmarked with the Energy framework under the title of ‘Utilities’ in August 2015. The below graph illustrates our progress towards best practice across the eight (8) activity areas. The orange bars reaching four (4) highlight best practice and the lower bars in blue indicate CSU’s current baseline ratings. An absence of a blue bar indicates ‘no progress’ for this activity area.